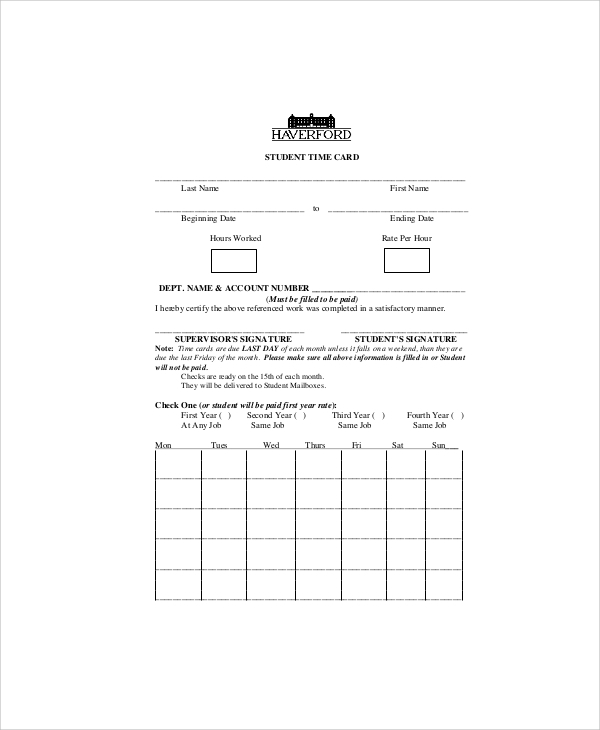 Time card template is one of the best measures to maintain and track the employee’s punctuality. These time sheet calculator is an easy method to maintain and handle the complete time frame of the project and it also helps to get the daily output of each employee. To make your work easier we have some wonderful templates which are available in PDF and word format. These templates can be completely customized for various industries. You can also see Sample Cards. 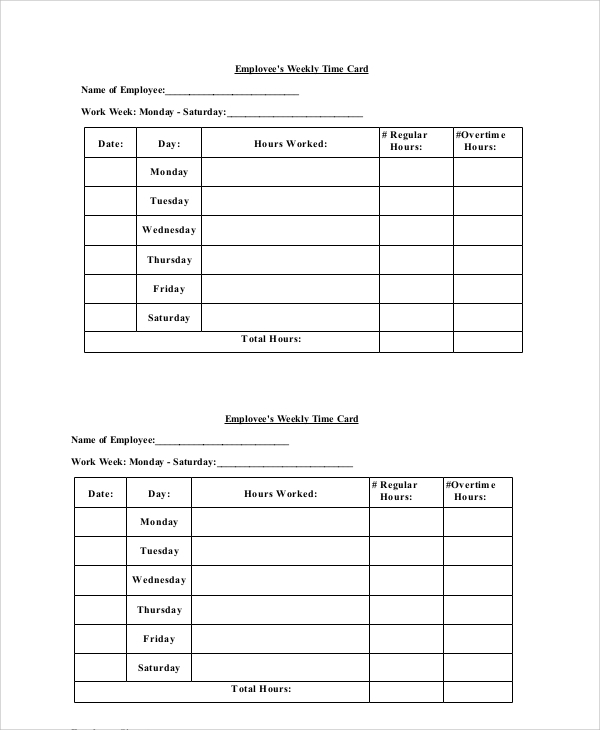 Employee time card template helps to count the full span of the employee, spent in office and it also helps to track the daily output of the employee. This employee time card will also help you to understand the progress of each task list of the employee. This template calculates the total working hours of each employee and their break time too. This template includes in time, out time, break time and over time. 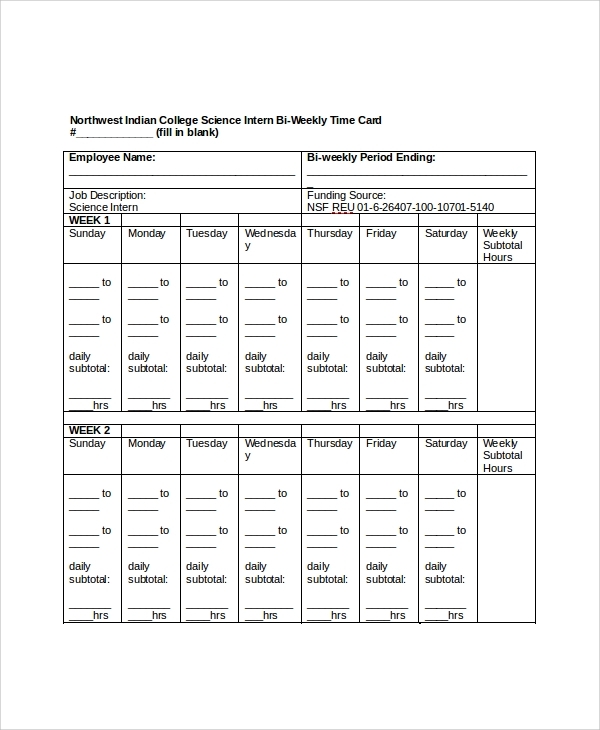 Weekly work time card template is helpful for calculating the time spent on each project by a particular employee. This method is very useful to measure the total progress in lieu of total hours spent by employee on particular project. 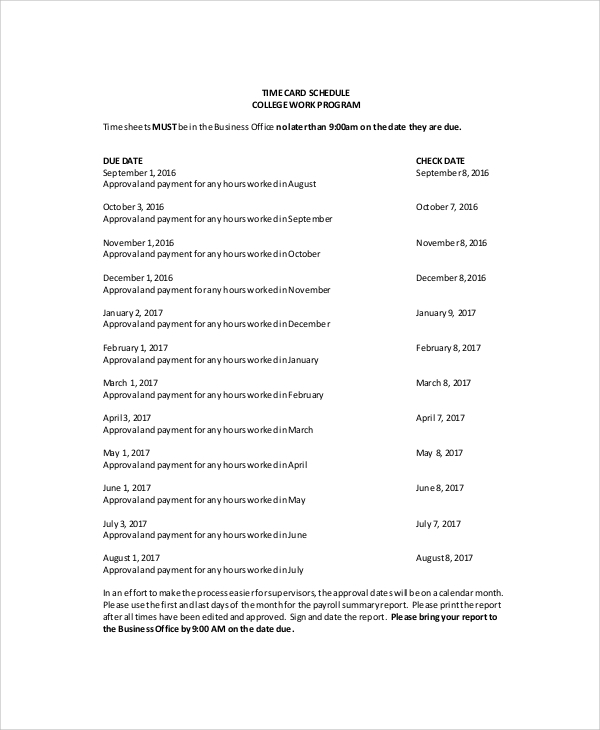 The Monthly time card template is helpful to calculate and check the work output of employees for four weeks continuously. This is a basic time card template available for your needs and it is useful for the appraisal process too. On a broader view, monthly progress of each employee can determine his overall output. 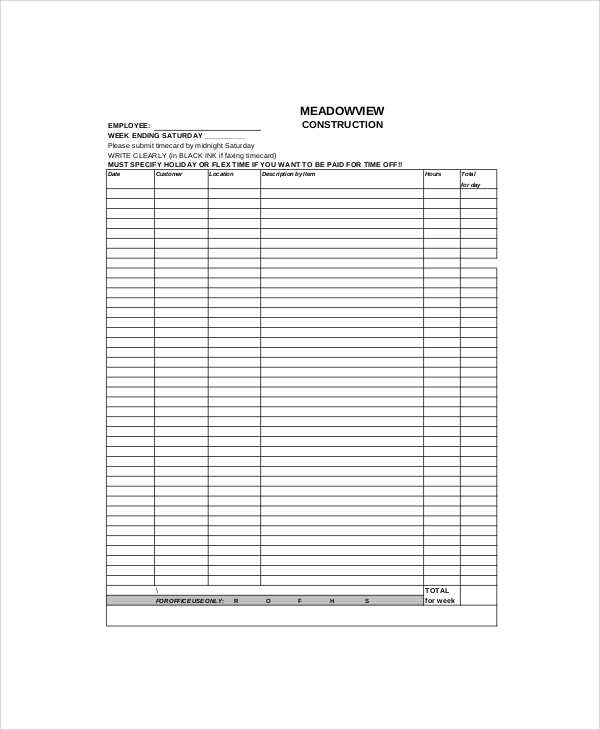 Construction Time Card Template is used to measure the work output of each construction unit at an interval of fifteen days. This template counts the total operating cost of the project . This template is useful to make a sudden check on the work output of each segment. Time card template is extremely useful and can be used for various industries to track the workflow and time schedule of all employees. This time sheet calculator helps to maintain the time limit of a particular project so that you can meet the deadlines properly. These time sheet can be useful for various industries such as project business, manufacturing industry, education industry, BPO, KPO, IT industry, FMCG sector, etc. This time card will help to track the records of each employee and his/her whereabouts. You can also see Business Cards. 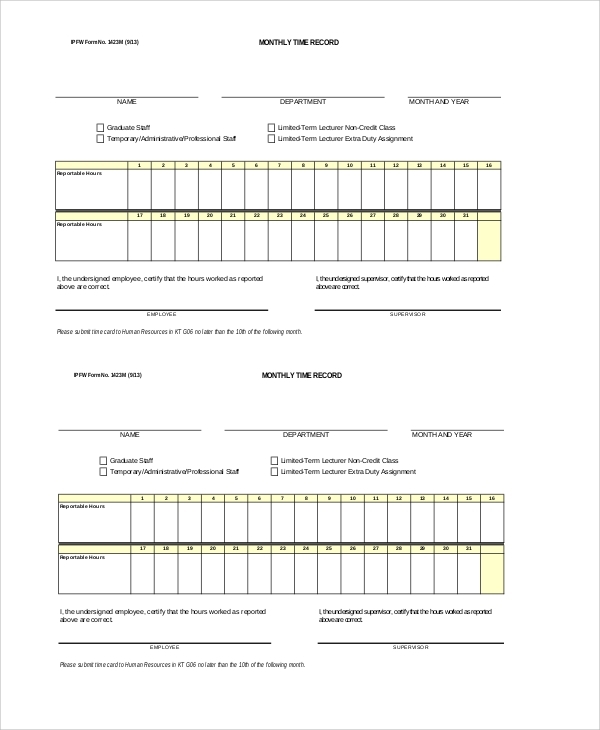 Why do I need Time Card Template? Every employer and even employee can track their daily work output. This will also find the loophole if the project is getting delayed after continuous hard work. Daily filling of time sheet will help you to display your work process to your managers and it will also help you in the appraisal process. These time cards are helpful for billing process against workers employed if you are maintaining the time sheet. Especially for project workers this time sheet is extremely useful. 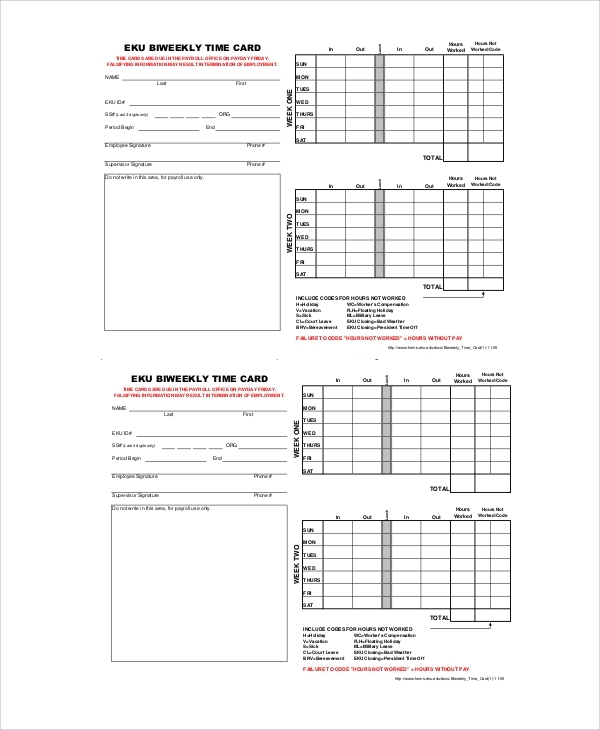 Preparing time card template is extremely easy. Just prepare the time sheet mentioning the days with date and work timing which will include daily in time and out time. Mention the break time in the template. In the note section, put the work which is done for that particular time frame. Time schedule maintenance is extremely important as this will help you to track every detail of each employee. Even employees can themselves monitor their work output which will help them to understand if they are lacking anywhere. Each company will be benefited if they maintain such templates for time card. 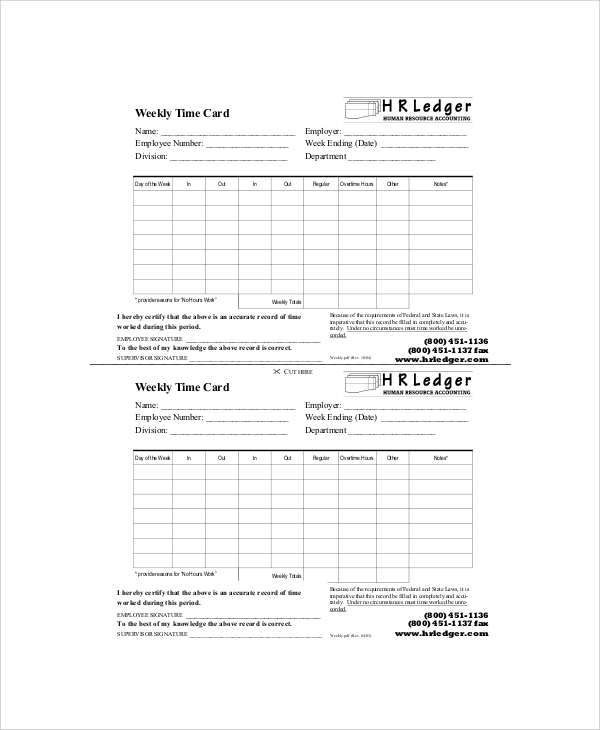 To make your work easier, we have some wonderful and easy to download time card templates, which one can download easily.